For the film, see Tin Pan Alley (film). For the play, see The Tin Pan Alley Rag. For the band, see Haruomi Hosono. Tin Pan Alley is the name given to the collection of New York City music publishers and songwriters who dominated the popular music of the United States in the late 19th century and early 20th century. The name originally referred to a specific place: West 28th Street between Fifth and Sixth Avenues in the Flower District of Manhattan; a plaque (see below) on the sidewalk on 28th Street between Broadway and Sixth commemorates it. 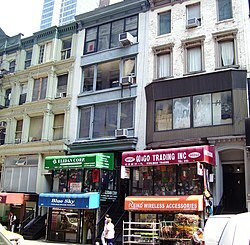 In 2019 the New York City Landmarks Preservation Commission took up the question of preserving five buildings on the north side of the street as a Tin Pan Alley Historic District. Various explanations have been advanced to account for the origins of the term "Tin Pan Alley". The most popular account holds that it was originally a derogatory reference by Monroe H. Rosenfeld in the New York Herald to the collective sound made by many "cheap upright pianos" all playing different tunes being reminiscent of the banging of tin pans in an alleyway. No article by Rosenfeld that uses the term has not been found. Simon Napier-Bell quotes an account of the origin of the name published in a 1930 book about the music business. In this version, popular songwriter Harry von Tilzer was being interviewed about the area around 28th Street and Fifth Avenue, where many music publishers had offices. Von Tilzer had modified his expensive Kindler & Collins piano by placing strips of paper down the strings to give the instrument a more percussive sound. The journalist told von Tilzer, "Your Kindler & Collins sounds exactly like a tin can. I'll call the article 'Tin Pan Alley'." With time, this nickname was popularly embraced and came to describe the American music publishing industry in general. The term then spread to the United Kingdom, where "Tin Pan Alley" is also used to describe Denmark Street in London's West End. In the 1920s the street became known as "Britain's Tin Pan Alley" because of its large number of music shops. In the mid-19th century, copyright control of melodies was not as strict, and publishers would often print their own versions of the songs popular at the time. With stronger copyright protection laws late in the century, songwriters, composers, lyricists, and publishers started working together for their mutual financial benefit. Songwriters would literally bang on the doors of Tin Pan Alley businesses to get new material. The commercial center of the popular music publishing industry changed during the course of the 19th century, starting in Boston and moving to Philadelphia, Chicago and Cincinnati before settling in New York City under the influence of new and vigorous publishers which concentrated on vocal music. The two most enterprising New York publishers were Willis Woodard and T.B. Harms, the first companies to specialize in popular songs rather than hymns or classical music. Naturally, these firms were located in the entertainment district, which, at the time, was centered on Union Square. Witmark was the first publishing house to move to West 28th Street as the entertainment district gradually shifted uptown, and by the late 1890s most publishers had followed their lead. The biggest music houses established themselves in New York City, but small local publishers – often connected with commercial printers or music stores – continued to flourish throughout the country, and there were important regional music publishing centers in Chicago, New Orleans, St. Louis, and Boston. When a tune became a significant local hit, rights to it were usually purchased from the local publisher by one of the big New York firms. The song publishers who created Tin Pan Alley frequently had backgrounds as salesmen. The background of Isadore Witmark was selling water filters. 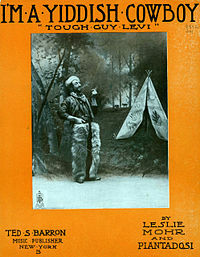 Leo Feist had sold corsets, and Joe Stern and Edward B. Marks had sold neckties and buttons respectively. The music houses in lower Manhattan were lively places, with a steady stream of songwriters, vaudeville and Broadway performers, musicians, and "song pluggers" coming and going. Aspiring songwriters came to demonstrate tunes they hoped to sell. When tunes were purchased from unknowns with no previous hits, the name of someone with the firm was often added as co-composer (in order to keep a higher percentage of royalties within the firm), or all rights to the song were purchased outright for a flat fee (including rights to put someone else's name on the sheet music as the composer). An extraordinary number of Jewish East European immigrants became the music publishers and song writers on Tin Pan Alley – the most famous being Irving Berlin. Songwriters who became established producers of successful songs were hired to be on the staff of the music houses. "Song pluggers" were pianists and singers who represented the music publishers, making their living demonstrating songs to promote sales of sheet music. Most music stores had song pluggers on staff. Other pluggers were employed by the publishers to travel and familiarize the public with their new publications. Among the ranks of song pluggers were George Gershwin, Harry Warren, Vincent Youmans and Al Sherman. A more aggressive form of song plugging was known as "booming": it meant buying dozens of tickets for shows, infiltrating the audience and then singing the song to be plugged. At Shapiro Bernstein, Louis Bernstein recalled taking his plugging crew to cycle races at Madison Square Garden: "They had 20,000 people there, we had a pianist and a singer with a large horn. We'd sing a song to them thirty times a night. They'd cheer and yell, and we kept pounding away at them. When people walked out, they'd be singing the song. They couldn't help it." When vaudeville performers played New York City, they would often visit various Tin Pan Alley firms to find new songs for their acts. Second- and third-rate performers often paid for rights to use a new song, while famous stars were given free copies of publisher's new numbers or were paid to perform them, the publishers knowing this was valuable advertising. 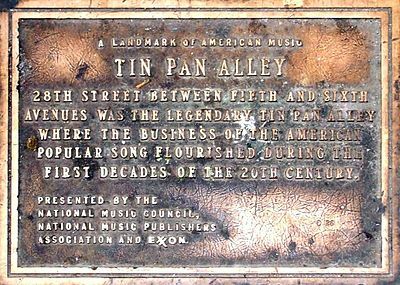 Initially Tin Pan Alley specialized in melodramatic ballads and comic novelty songs, but it embraced the newly popular styles of the cakewalk and ragtime music. Later on jazz and blues were incorporated, although less completely, as Tin Pan Alley was oriented towards producing songs that amateur singers or small town bands could perform from printed music. In the 1910s and 1920s Tin Pan Alley published pop-songs and dance numbers created in newly popular jazz and blues styles. A group of Tin Pan Alley music houses formed the Music Publishers Association of the United States on June 11, 1895, and unsuccessfully lobbied the federal government in favor of the Treloar Copyright Bill, which would have changed the term of copyright for published music from 24 to 40 years, renewable for an additional 20 instead of 14 years. The bill would also have included music among the subject matter covered by the Manufacturing clause of the International Copyright Act of 1891. The American Society of Composers, Authors, and Publishers (ASCAP) was founded in 1914 to aid and protect the interests of established publishers and composers. New members were only admitted with sponsorship of existing members. The term and established business methodologies associated with Tin Pan Alley persisted into the 1960s when innovative artists like Bob Dylan helped establish new norms. Referring to the dominant conventions of music publishers of the early 20th century, "Tin Pan Alley is gone," Bob Dylan proclaimed in 1985, "I put an end to it. People can record their own songs now." During the Second World War, Tin Pan Alley and the federal government teamed up to produce a war song that would inspire the American public to support the fight against the Axis, something they both "seemed to believe … was vital to the war effort." The Office of War Information was in charge of this project, and believed that Tin Pan Alley contained "a reservoir of talent and competence capable of influencing people's feelings and opinions" that it "might be capable of even greater influence during wartime than [George M. Cohan's "Over There" during World War I]." The song "Over There" can be said to be the most popular and resonant patriotic song associated with World War I. Due to the large fan base of Tin Pan Alley, the government believed that this sector of the music business would be far-reaching in spreading patriotic sentiments. In the United States Congress, congressmen quarrelled over a proposal to exempt musicians and other entertainers from the draft in order to remain in the country to boost morale. Stateside, these artists and performers were continuously using available media to promote the war effort and to demonstrate a commitment to victory. However, the proposal was contested by those who strongly believed that only those who provided more substantial contributions to the war effort should benefit from any draft legislation. As the war progressed, those in charge of writing the would-be national war song began to understand that the interest of the public lay elsewhere. Since the music would take up such a large amount of airtime, it was imperative that the writing be consistent with the war message that the radio was carrying throughout the nation. In her book, God Bless America: Tin Pan Alley Goes to War, Kathleen E.R. Smith writes that "escapism seemed to be a high priority for music listeners," leading "the composers of Tin Pan Alley [to struggle] to write a war song that would appeal both to civilians and the armed forces." By the end of the war, no such song had been produced that could rival hits like "Over There" from World War I. Whether or not the number of songs circulated from Tin Pan Alley between 1939 and 1945 was greater than during the First World War is still debated. In his book The Songs That Fought the War: Popular Music and the Home Front, John Bush Jones cites Jeffrey C. Livingstone as claiming that Tin Pan Alley released more songs during World War I than it did in World War II. Jones, on the other hand, argues that "there is also strong documentary evidence that the output of American war-related songs during World War II was most probably unsurpassed in any other war." In the 1959–1960 television season, NBC aired a sitcom Love and Marriage, based on the fictitious William Harris Music Publishing Company set in Tin Pan Alley. William Demarest, Stubby Kaye, Jeanne Bal, and Murray Hamilton co-starred in the series, which aired 18 episodes. In the song "Bob Dylan's Blues" from Bob Dylan's 1963 album The Freewheelin' Bob Dylan, he introduces the song, saying, "Unlike most of the songs nowadays that have been written up town in Tin Pan Alley, that's where most of the folk songs come from nowadays, this, this is a song, this wasn't written up there, this was written down somewhere in the United States." In the song "Bitter Fingers" from the 1975 autobiographical "concept album" Captain Fantastic and the Brown Dirt Cowboy, Elton John refers to himself and his longtime song-writing partner, lyricist Bernie Taupin, as the "Tin Pan Alley Twins". Neil Diamond's liner notes ("...tin pan alley died hard, but there was always the music to keep you going...") indicate that the album Beautiful Noise (1976) was intended as a tribute to his days there. The song "Tin Pan Alley" by The Apples in Stereo. Tin Pan Alley of the 1960s was discussed by Robbie Robertson of The Band in the Martin Scorsese film of The Band's final concert in 1976, The Last Waltz. The song "Who Are You" by The Who has the stanza "I stretched back and I hiccupped / And looked back on my busy day / Eleven hours in the Tin Pan / God, there's got to be another way", which references a long legal meeting with music publisher Allen Klein. In the 1970s to early 1980s, a Times Square bar named Tin Pan Alley, its owners, Steve d'Agroso and Maggie Smith, and many of its patrons were the real-life inspiration for the HBO series The Deuce. The bar was renamed The Hi-Hat in the series. Denmark Street, known as "Britain's Tin Pan Alley"
^ "Manhattan's Tin Pan Alley could become a city landmark". am New York. Retrieved March 18, 2019. ^ Charlton (2011), p.3 Quote: the "term Tin Pan Alley referred to the thin, tinny tone quality of cheap upright pianos used in music publisher's offices." ^ Brackett, David (2005). The Pop, Rock, and Soul Reader: Histories and Debates. Irvington, New York: Oxford University Press. ISBN 0195125711. ^ "Bob Dylan, Titan Of American Music, Wins 2016 Nobel Prize In Literature". ^ Hajduk, John (December 2003). "Tin Pan Alley on the March: Popular Music, World War II, and the Quest for a Great War Song". Popular Music and Society. 26 (4). ^ "The Deuce: Behind the Scenes Podcast 72". The Rialto Report. September 3, 2017. Retrieved January 5, 2019. Charlton, Katherine (2011). Rock music style: a history. New York: McGraw Hill. Forte, Allen. Listening to Classic American Popular Songs. New Haven: Yale University Press, 2001. Furia, Philip (1990). The Poets of Tin Pan Alley: A History of America’s Great Lyricists. ISBN 0-19-507473-4. .
Furia, Philip and Lasser, Michael (2006). The American's Songs: The Stories Behind the Songs of Broadway, Hollywood, and Tin Pan Alley. ISBN 0-415-99052-1. CS1 maint: Multiple names: authors list (link). Goldberg, Isaac. Tin Pan Alley, A Chronicle of American Music. New York: Frederick Ungar, , 1961. Hajduk, John C. "Tin Pan Alley on the March: Popular Music, World War II, and the Quest for a Great War Song." Popular Music and Society 26.4 (2003): 497-512. Jasen, David A., and Gene Jones. Spreadin’ Rhythm Around: Black Popular Songwriters, 1880–1930. New York: Schirmer Books, 1998. Jones, John Bush (2015). Reinventing Dixie: Tin Pan Alley's Songs and the Creation of the Mythic South. Louisiana State University Press. ISBN 9780807159446. OCLC 894313622. Marks, Edward B., as told to Abbott J. Liebling. They All Sang: From Tony Pastor to Rudy Vallée. New York: Viking Press, 1934. Napier-Bell, Simon (2014). Ta-ra-ra-Boom-de-ay: The Beginning of the Music Business. ISBN 978-1-78352-031-2. Sanjek, Russell. American Popular Music and Its Business: The First Four Hundred Years, Volume III, From 1900 to 1984. New York: Oxford University Press, 1988. Sanjek, Russell. From Print to Plastic: Publishing and Promoting America’s Popular Music, 1900–1980. I.S.A.M. Monographs: Number 20. Brooklyn: Institute for Studies in American Music, Conservatory of Music, Brooklyn College, City University of New York, 1983. Wilder, Alec. American Popular Song: The Great Innovators, 1900–1950. London: Oxford University Press, 1972. Wikimedia Commons has media related to Tin Pan Alley.